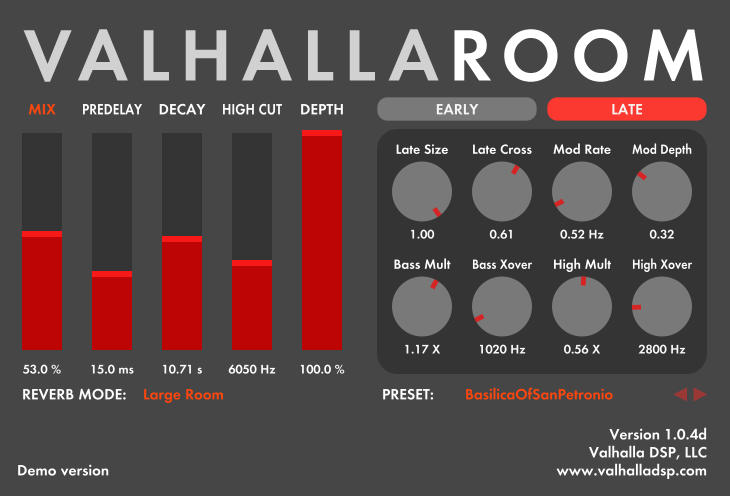 ValhallaRoom by Valhalla DSP is a Virtual Effect Audio Plugin. It functions as a VST Plugin, an Audio Units Plugin, an RTAS Plugin and an AAX Plugin. Mix lock functionality for the Mix slider. By clicking on the MIX label above the slider, the user can lock and unlock the mix level when browsing through presets. Preset previous/next arrows, for quickly scrolling through presets. the first time I've load this plugins on a track, I was disappointed .was clean, too much clean, I start to believe that I made a mistake, I regret to buy it...Then I go back to my good old loved tsar 1 & Audio Damage reverb, until a day that none of the reverb I own and know fit to my need. I remember I have VR, I load it, tweak it and BOOM! Magic! 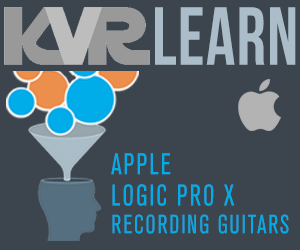 it does what I expect, I remember I bunch of mysong project and replace TSAR 1 with VR, it do it again! It quickly become my favorite reverb, then problems come... I had to sell it, I miss it a lot! finally I was able to buy it again and keep it forever. The reverb is magic when you know how to use it and adjust it to your need. 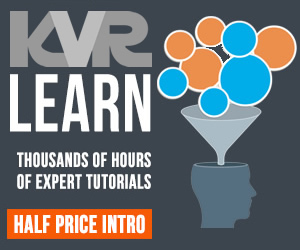 I own TSAR 1, NF Blueverb and 80, Audio Damage verb, Waves reverb, Vengeance sound reverb .they are different and very good, but none of all this reverb is clean like Vroom. I never really felt the need to get a proper reverb (beside the daw-included ones), but testing v-room changed my mind. It immediately filled my music/mixes with room (hence the name). It's sounding natural and full, but still clear without making the mix muddy (that goes for all 9 reverb-modes without an exception). Another important part is it's easy to use gui. Especially for a reverb-beginner like me it's clearly structured and has a helpful tooltip while the cursor crosses a knob/fader. Some may say the gui is to simple, but i really like the simplicity without any embellishment. There are many presets included that can serve as a good start, but it's in the nature of reverbs, that it's used best with own adjustment, depending on music and the desired effect. I must admit, that i'm not really an enthusiastic reverb-tester and my initial test of v-room was mostly based on the good reviews that it got in several forums, blogs etc. but i can't imagine there's much better value for money concerning reverb. And regarding the fact that it got several new reverb-modes during it's development from 1.0.0. to 1.0.9. it seems also like a good investment in the future, as i'm sure there will be many more modes in future updates. I used to underuse reverb until I heard the demo of this plugin. My reasons were that usually, I couldn't get 'musical results' or I was fearful of muddying up my mixes. V-Room combats these symptoms by having a sound which seems to caress both your ears, and the dry source sound, whilst having enough controls to be simple to use, yet capable of anything from realistic ambiences, to pulsating walls of transparent sound, where time seems to stand still. The modulation can be downright hypnotic. It's soothing and relaxing, and draws you into the soundfield, without ever sounding synthetic or obvious. As such V-Room is capable of chorus duties with minimal reverb times, and outperforms most chorus units in terms of sheer results. V-Room is one of the few effect plugins that I would say feels like a musical instrument in-and-of it's-self. Parameters are easy to adjust smoothly in realtime, and you WILL play with the reverb depth, size, length, etc, while it runs, without the slightest hiccup. I don't know how many algorythms this thing will finally have, but the latest addition, sulaco, is one of my favourites. It's mellow and 'woody'. Given the number of different reverb types, and just the right amount of parameters (which are common to each type), a lot of tweaking is possible. But if that's not your thing, there are an adequate amount of well chosen presets to get you where you need to be.